When I was about 6 years old I saw president Kennedy's head being blown off, on the just new invented media called television. After that I saw the so called suspect being shot by some so called 'bystander' called Jack Ruby. 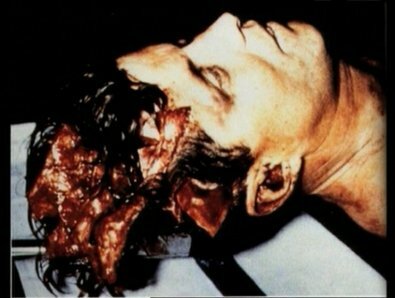 But the forensic evidence tells another story, the forensic evidence tells that the fatal shot came from somewhere left front from where Kennedy was sitting. Observe on his right forehead the 'V' cut where the entrance wound from a small bullet (.22) was visible. Only a small explosion from a special developed bullit, could have blown up a skull so completely. Kennedy had promissed to 'shatter the CIA into a thousand pieces', and he was going to issue new money. Money, free from the control of the Federal Reserve private banking families. Never forget that a small group of people rule the world, and the above is how they do it!! By brutal force, it was a COUP D'ETAT. "If they can kill the president they can kill anybody". i dont believe you. i think what your saying is a load of crap. any gun shot from a far distance has a larger entrance wound because the entrance is immediate. the exit wound, which wouldve been around .22 cen in diameter would fit as a better explaination because it had to go throught bone and tissue matter to exit his head. plus you were 6! and that was 40 yrs ago. your mind could be seeing something to fit around your own narrow minded opinions. Wow, its amazing how so many people can be so heartless, he had family just like the rest of us. I don't think he ever trully meant any evil with the things he did while in office. Its to bad he had to die such a terrible death. Exit wounds are usually bigger than entrance wounds. You guys dont know anything about guns so you should keep your mouths shut and there are such things as exploding bullets, they are called billistic tip rounds. Idiots. i don't believe a .22 shot from 100+ feet away could cause such devastating effects. even at close range, that small caliber has trouble tearing up a skull. Haven't you tards ever heard of a 22-250? Its a .22 bullet with a nearly .308 sized casing. Fantastic deer rifle. Great trajectory, extremely accurate, tons of power. Could've easily made this wound. No need for a "special" bullet. The reason it went straight through his neck was because it's soft tissue. The bone in his skull tried to stop it, all the energy had to be released somehow. This is the result of that massive amount of energy being quickly exsorbed. I am doing a report on jfk, i never really knew until now!!!!!!!!!!!!! JFK could have easily killed by a exploding round its called a ballistic tip. but if that was used his whole head would have exploded. looking at the picture of his head it looks as though it was not a ballistic round but more of a large caliber- maybe a 22-250 - was more likely used. because only the back of his head is blown outward. This blog is meant to be an eye-opener. It's supposed to make you look upon the world in a different way. A way where you use your own eyes, and your own thoughts. Not the stuff you've been tought to think and see. Don't be mislead by your leaders, they are misleaders. Don't be mislead by your religion, it's only there to keep you appart from your brothers. The more you investigate, the more you discover that we have been lied to by every institusion on this planet. What makes you think that the religions are the one exception? They are at the bottom of all the evil and filth that goes on throughout this world. !!! When I was about 6 years old I saw president Kennedy's head being blown of, on the just new invented media called television.....After that I saw the so called suspect being shot by some so called 'bystander' called Jack Ruby"
You could not have seen the Zapruder film on TV then. I could not have seen the zapruder film on TV then. But that doesn't change the fact I never heard a good scenario, explaining the questions raised during the investigations. It is just like 9/11. There are so many questions never explained by the government. For instance the explosions just before the buildings collapsed. What ever names you call me, I think we are being lied to, Big Time!!! We are being lied to, and lied to, and lied to, untill we don't know any better. Anyway, thanks for all the reactions. 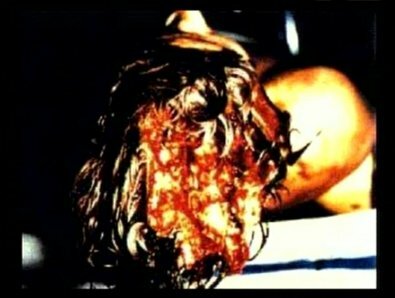 I really can't believe there are pictures of dead Kennedy. Crazy how I came across your blog, nevertheless you've got some really interesting topics. Have you never seen these pictures before? I can imagine they didn't show it in America. It was sad time in American history, and that should have outraged the nation to the point where jfk bill should have been passed instead of being revoked . Americans are their own worse enemy and scapegoat it on the rest of the globe. I just took a look at one of your blogs. And though I think I am a bit older than you (I'm 53) you seem to have the same way of critically looking at the world around you as I have. I think Kennedy was killed 'cause of bill 11110, in combination with his plans to stop the war in Vietnam. There is a documentary "Understanding Anti Semitism"
You can find it second from the bottom in "Links to must see videos". And did you ever heard of "Jews Against Zionism"? You spelled off wrong. its O F F not O F.
I would believe you more if you spelled correctly. Bullet is spelled with an e, not an i.
I was five years old in 1963. We did NOT see Kennedy "get his head blown off." Obviously, if there had been television cameras there, that footage would be very well known. Everybody thanks for correcting my mistakes in spelling. As You can see, I corrected them. All comments are welcome, even the critics. Hope ye'all return one day to TDP.